There is no reference work that encompasses the entire fieldof biophysics and unites the different areas of research through deep foundational reviews. 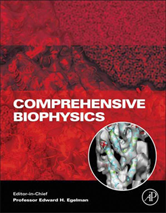 Comprehensive Biophysics fills this vacuum, being a definitive work on biophysics. It will help users apply context to the diverse journal literature offering, and aid them in identifying areas for further research.